was reading Elaine Scarry’s The Body in Pain which is about how the experience of pain is this universal experience but it remains very undescribed and she talks about a lot of really heavy stuff like torture and war and what those do and then she moves to creativity and poetry and what that can do. I was reading that, I was reading a lot of Beckett and thinking about being a U.S. citizen and being complicit in a lot of nasty governmental extracurriculars. I knew that in part that story wasn’t my story to tell, but I was trying to talk about being complicit in that. But it only fails. In a way that’s interesting. It’s poetry. Complicity is a notion I seemed to return to time and again when I sat down with Tuck’s new release from Oakland’s Timeless, Infinite Light Press. Nearing the end of the collection is “[pretend some business],” a piece filled with prefixes of negation, un– this and no that, don’t and isn’t and without. In the margins, I scribbled: such refusal, such not-quite-understanding of what is ‘un’natural; things out of proportion, out of expectation and the questions, really, become – why, and, why must these things be done? 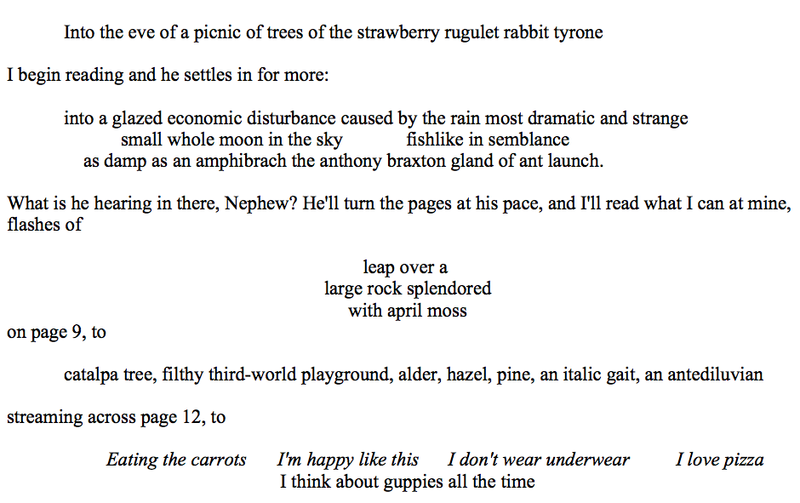 The build here amounted to more marginalia – the thinking through of what struck me so about Tuck’s poetry. 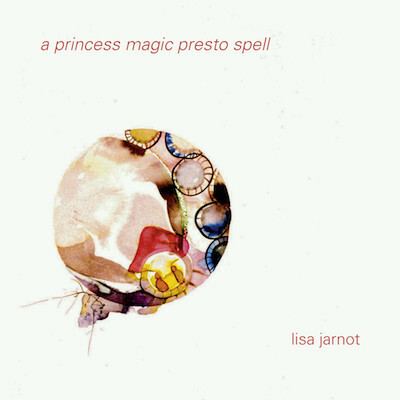 For now: how stealthily these poems work, relying so much on preconceived notions many of us, however thoughtful we might like to see ourselves, don’t sit down and examine. With that, Tuck weaves her poems which are at once felt full of a sense of the automatic, winding, moving observantly at a steady pace. At the same time, we are reminded Tuck doesn’t spill herself on the page and walk away, leaving readers to make sense of the arcs and lines of written language. Moments when we can glimpse some of her craft’s structure are where we feel most invited in, perhaps not to struggle with her, but enough to make sure we remember we’re reading someone bare here, and that the access we are being offered – goodness, what a privilege. The focus of our collective gaze turns from mystery of the invited intruder to love, to love, to action. By letting our focus shift, we were made complicit in the crime, and not so unhappily, with Tuck as our guide, our binoculars. With this language of kinds of torture, of war, of, at the very least, wounds or what wounds do, complicit was an easy and ready word which felt full, captivated, in my synapses as they sparked against the sounds of Tuck’s poems. Until I realized how perfectly wrong the term was. 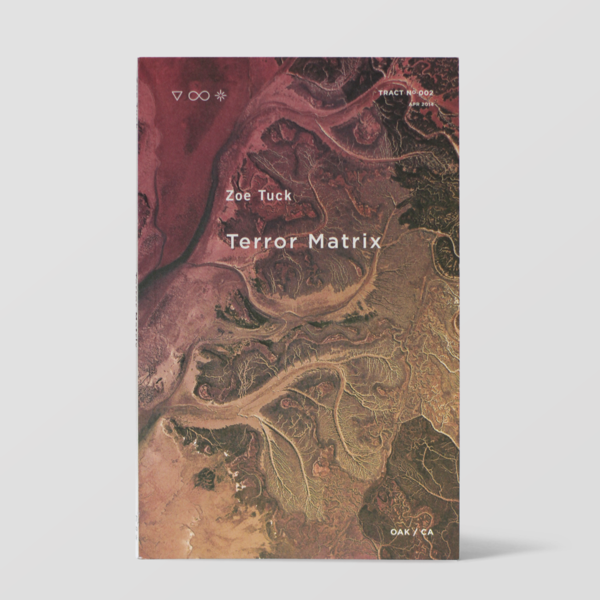 A quiet part of the project with Terror Matrix is sussing out a feeling of how to be a citizen in a war-time country where we often feel neither responsible nor terribly involved in choices our government is making. This difficulty is paralleled in how Tuck dealt with understanding Scarry’s The Body in Pain, and the larger project of how Tuck deals with understanding her own body in her own society. What does it mean to be – feminine? Injured? Privileged? What does it mean? These poems don’t even have to resist a lofty eagerness to keep the reader at bay with philosophical wonderings, they do so with ease. 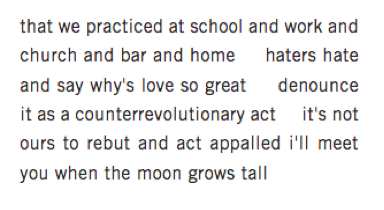 Tuck uses language ranging from technical to colloquial, makes each poem compact in a justified column, and in doing so creates a kind of newspaper clipping. These are broadcasts from the edge of unknowns, but not unreachables. As Tuck told Wintz in her interview, “sometimes when I’m reading a poem or writing a poem, it solves a problem that I didn’t know existed while rearranging the inside of my body.” These edges, these unknowns – these are the spaces where Tuck calls out to us from – simply, beautifully, to say this is where she is right now. While Ben Fama’s Ugly Duckling Presse chapbook Aquarius Rising has sold out since its 2010 release, it is safe in the archives of the organization’s free online archives. Here, we can almost feel the letterpressed pages – the polymer plate constellation printed on a practically Pantone 3258-teal cover, the Sabon-set text’s clean lines running beneath the fingertips as he says, time and again, not loudly but still insistently: wake up! it is a mission etched into the underside stone of a bridge we cross over daily. Reaching back to the opening Hakim Bey epigraph (“the universe wants to play”), Fama is finding a balance around the poles of levity – lightness, because there is so much to hold our hopefulness, and weightiness, because what is divine can destroy. It is not simply messed up to abide by a code of seriousness, so much as it is “fucked up” to posture ourselves into these modes without sincerity. The collection read quickly not because there was any lacking depth, but because the complexity spoke to a difficulty I found incredibly accessible. More so, the poems’ forms are often without line-end punctuation, but generally end-stopped, as if to say the grammar or sentence structure might not continue, but the ideas have no need to be so formally discontinued one from the other. the long way if I remember. If “home” is a place where our thoughts, like our bodies, find rest, let us wander a bit longer to stretch our legs, along with the last bits of that imagining of our marriages to moons. And what a pinch of regret to think the wandering way is forgotten, the play Bey encourages, the space for a less serious living, is something we broke, made docile or domesticated. 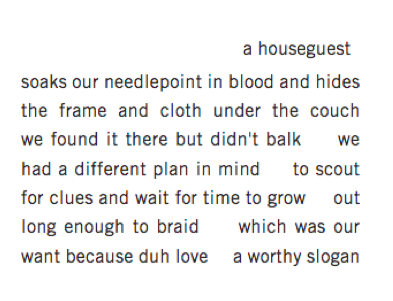 Or worse – that “the world thrives on misunderstanding / a cloud full of mature situations.” In the chapbook’s closing poem “Tauromachy,” a piece sequenced almost in aphorisms (perhaps, a nod to us over-analyzers, those of us inclined towards seriousness-seeking? The easy question of why enter us into Aquarius and exit us several signs over with Taurus? Well, perhaps, because the water-bearer and the bull…) we are again shown sequins and magic, animal life and our seemingly contemporary impulse or illness away from the beautiful, the simple, the unexplainable. Aquarius Rising is a collection to keep close at hand, a good literary friend to help us linger somewhere unknown. Because we can. 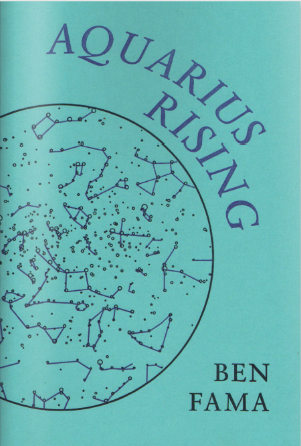 Ben Fama’s Aquarius Rising is sold out in its print edition but can be found for free at Ugly Duckling Press’s Online Chapbook Archive. Fama’s first full collection, Fantasy, will be published by UDP in 2015.
so few rapids broken open with their backs. I empty bottles at the lips of the burn. these aren’t tactics of distancing, but invitations. I often found myself dreaming of these worlds weeks after I’d lived in them because of Militello’s management of careful details. Again and again, the poems provide case studies for building complete worlds with these descriptions, but without becoming prescriptive. That is what I’d been welcomed for, not just to see the winter-world, cemetery or riverbed, but to move about the branches fallen with my own snow-shoed feet. By situating her readers in this way of recreation through reading, Militello further reinforces the project of connection I see her building. Under the guise of epigraphs by Joseph Heller and Dylan Thomas, we are rooted from the first in an effort to find ourselves in our surroundings, what it means to be human with memory, in a landscape of trees which decay and metals which can be remelted, and ever-changing spaciousness. From there, in Body Thesaurus, we are so often separated. On the whole, there is a persistent loneliness to these poems, focusing in on the isolation of trying so hard to define the self and the relationships we neglect as a result of our impulse to turn ever inward. 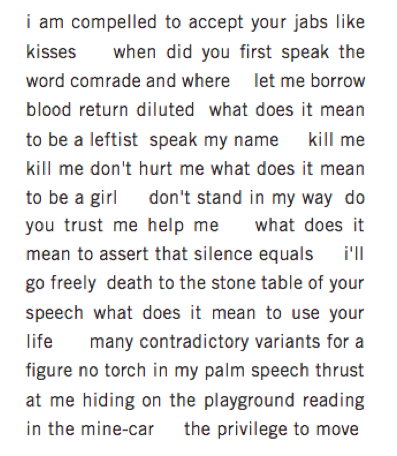 Structurally, Militello constructs the difficulty of this as a strict dichotomy through her forming seven sections — plus prelude and postscript poems — each with a heading of what the self is not: a shadow of the self, a symptom, a battery of tests, what is said about the self, a study of the world, and a cure. We often come to understand ourselves or our situations by the void, the ‘not’ statements, and these headings suggest science, a factualness that Militello then resists with the exactitude of her worlds, worlds verifiable only by our complicity. No research or study will make this cartography hold. This passage in particular alternates between soft hums of ‘m,’ lulling ‘ou,’ and strikes of ‘x’s, ‘k’s, the mouthful immediately engaging our auditory attention for the contrasts and shifts that will sustain us throughout Body Thesaurus. We are being remade through redirection of our attention away from ourselves, beyond our current circumstances and the tired ways we talk about them. Militello isn’t necessarily telling us much we don’t already know within these piles of bones, but she does so accessibly, crafting images that ultimately feel so starkly intuitive, threading together phrases so surprisingly natural to how the mouth moves, we want them to be as integral to our physical bodies as the figures she allows us to inhabit. We might be unsure of ourselves, but we are trying, searching for a quiet song, a dark woods that holds not the word, but the many words that make real the feeling we had as we understood how incomplete we were yesterday.